I had an opportunity to pack a delightful catered picnic for a friend, but I simply didn't want to do the 'same ole, same ole'... 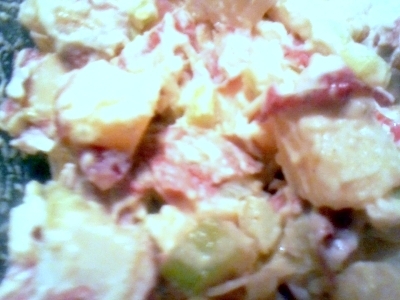 So I've kept the traditional entities: chicken, potato salad, coleslaw... But I've mixed it up a bit? 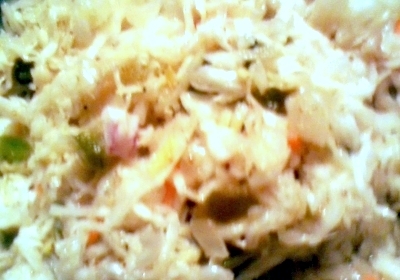 Now – since I hadn't used much mustard or any sweetness in the potato salad, why not in the slaw? So this sweet and sour recipe from Southern Food fit my bill. Honestly, once all your veggies are prepped, this goes together in just a few minutes, and then you chill for a couple hours before serving... A tad too much oil, if you ask me... so I drained some off before packaging. 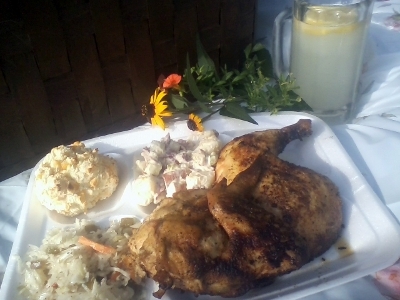 The chicken was simple – butterflied then grilled with a constant and generous basting of Salamida's State Fair Chicken Sauce . Cut down the middle for two generous servings. Done. And you know me – a little time left over, so what else can I do? Some garlic and cheddar biscuits - heck they only take a few minutes... I'll include a jar of those Horseradish Pickles for good measure. Not a bad picnic, eh? Couldn't resist the 'portioned' plate that is so infamous at chicken barbeques... It WILL be enjoyed, I assure you!